KENNEDY SPACE CENTER, Fla. — United Launch Alliance (ULA) sent a new Tracking and Data Relay Satellite (TDRS) into orbit for NASA Jan. 23, buttressing a constellation that provides the critical communications link between the international space station, the Hubble Space Telescope and dozens of other spacecraft in low Earth orbits. The Atlas 5 rocket lifted off at 9:33 p.m. EST from Cape Canaveral Air Force Station’s Launch Complex 41, completing the first of 15 planned launches for ULA, a partnership of Lockheed Martin and Boeing, which also flies Delta boosters. 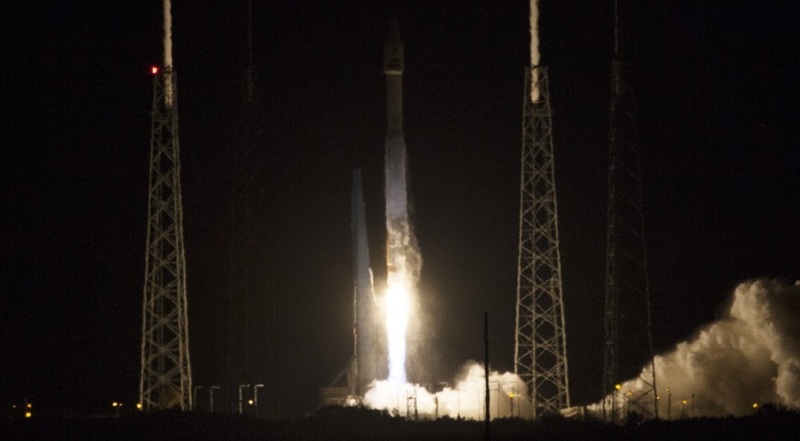 The rocket’s Centaur upper stage deployed the TDRS-L satellite into geosynchronous transfer orbit about two hours later. Ultimately, the 3,450-kilogram TDRS-L satellite will orbit about 35,800 kilometers above the equator, joining an eight-member network strategically positioned over the Atlantic, Pacific and Indian oceans. NASA does not expect to need the new TDRS-L satellite — the second of three planned in the Boeing-built, third-generation TDRS line — until about 2020. But buying and flying now not only provides NASA additional backup if one or more members of the existing constellation fails earlier than expected, it also saves money, Badri Younes, NASA’s deputy associate administrator for space communications and navigation, told reporters during a prelaunch press conference. The agency paid about $715 million for both TDRS-K, which was launched in January 2013, and TDRS-L, Younes said. A small amount of the money also covered an ongoing upgrade to the TDRS prime ground communications site in White Sands, N.M. NASA also exercised a $290 million contract option in 2011 for a third satellite, TDRS-M, which the agency expects to be ready for a 2016 launch. NASA relies on the TDRS network to track and provide multiple communications links, including live television, with the space station and its growing cadre of visiting vehicles, as well as support its fleets of Earth-observing satellites, telescopes and other spacecraft orbiting between about 500 kilometers and 1,000 kilometers above Earth. “The TDRS satellites must track an object 22,000 miles away that is moving across the face of the Earth roughly every 45 minutes. This capability is analogous to standing at the top of the Empire State Building and tracking an ant as it marches its way down the sidewalk in front of the building,” said Andy Kopito, civil space programs director with Boeing Space and Intelligence Systems. The TDRS system also is used by the U.S. military, non-U.S. space agencies and commercial companies — including ULA, which taps TDRS to track its rockets during flight. Sometimes NASA barters TDRS time for services, including science data, and sometimes it collects money. One minute on TDRS’s highest bandwidth, which is 300 megabits per second, costs $139, Younes said. The agency is in the process of phasing out per-minutes costs, he added, in favor of charging for percentage of use. Beginning this year, the military is no longer reimbursing NASA for any TDRS operating costs, which run about $70 million to $80 million per year, Younes said. NASA plans to add one more TDRS satellite to its network while it develops the technology and operations plan for a next-generation system that includes laser communications. The recent test using the Moon-orbiting Lunar Atmosphere and Dust Environment Explorer spacecraft gave NASA confidence to proceed with the purchase of hosted payload accommodations on a Space Systems/Loral satellite for an experimental laser communications system that will begin a two-year test flight in 2017, Younes said. The first user is likely to be the space station. Of the 11 previous TDRS satellites, eight remain in orbit. Two were decommissioned and one was destroyed in the 1986 Challenger accident. The TDRS system also is used by the U.S. military, non-U.S. space agencies and commercial companies – including ULA which taps TDRS to track its rockets during flight. Sometimes NASA barters TDRS time for services, including science data, and sometimes it collects money. One minute on TDRS’s highest bandwidth, which is 300 megabits per second, costs $139, Younes said. The recent test using the Moon-orbiting LADEE spacecraft gave NASA confidence to proceed with the purchase of hosted payload accommodations on a Space Systems/Loral satellite for an experimental laser communications system that will begin a two-year test flight in 2017, Younes said. The first user is likely to be the space station.